Cocktail and dress rings are incredibly extravagant, often including coloured gemstones as well as diamonds. 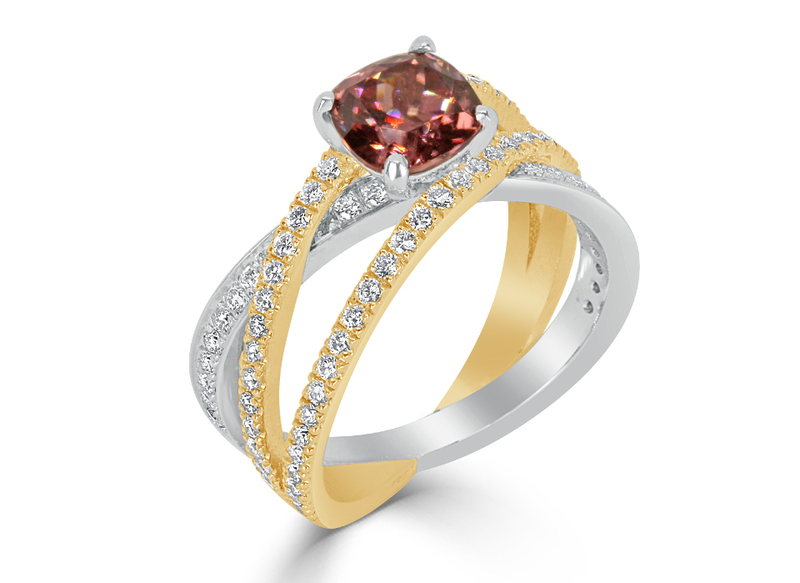 With cocktail and dress rings it all comes down to your inclination for colour or type of gemstone. There is no specific shape or style to adhere to with these rings, just the flashier, the better, and any combination of precious metals and coloured stones can be used to create a flamboyant display. These rings are most often designed to document a momentous occasion and worn sparingly rather than daily. GN Designer Jewellers specialises in custom-made jewellery, so your choice of cocktail rings and dress rings is not limited to what we have on display in our Melbourne showroom or our online store. You may wish to choose from one of our traditional styles for something timeless and classic or create something unique and totally you. GN Designer Jewellers can help you design the perfect cocktail and dress rings for any occasion, and adhere to any budget. Dress and cocktail rings can easily jazz up any outfit, and our Melbourne showroom has plenty of stunning cocktail rings and dress rings on display, though if you want something truly personal and unique, our expert jewellers can forge something new based on your designs. At the top of their field for jewellery making and design, the team at GN Designer Jewellers will spend time getting to know you and work closely with you to come up with a one-of-a-kind, handcrafted, custom-made cocktail or dress ring. Cocktail rings and dress rings are intended to attract attention, to stand out at a cocktail or dinner party. They became fashionable in the 1920’s when cocktail parties were becoming increasingly popular. Prohibition laws in America during the 1920’s lead to secret underground parties with low-quality homemade alcohol. This is what lead to the rise in cocktails; it was an attempt to mask the poor taste of the liquor. Once prohibition lifted, these parties became rampant, and the cocktails were made bigger and brighter, and so the rings on the hands holding them followed suit. The dress ring, also commonly called a dinner ring, is generally just as large and glamorous but typically utilises gemstones at the centre rather than diamonds. The dinner parties were often less wild that the cocktail parties and thus the rings were also somewhat subdued. Generally worn on any finger, and coming in any colour, style and shape, these rings are designed to make a statement. GN Designer Jewellers has an expert team of craftspeople to create and forge spectacular dress rings and cocktail rings. Something as exceptional as a personally designed and handcrafted dress ring deserves professional care. At GN Designer Jewellers in Melbourne, we offer lifetime options for care, cleaning and remodelling to protect the brilliance of your cocktail rings. We can also help you in arranging the right insurance for your jewellery to cover eventualities that are often not included in general home and contents insurance coverage. GN Designer Jewellers endorse QReport over other insurers, and we encourage securing insurance for loss, theft and damage so your precious cocktail rings and dress rings remain secure. There are so many options available when it comes to selecting your dress rings. Platinum or white gold are timeless choices, while yellow and rose gold lend very well to the vintage appeal of cocktail rings. When it comes to stones, there are so many precious gemstones available, and the choice can be somewhat overwhelming. While tanzanite and sapphire are popular choices, with cocktail rings, the purpose is to showcase a bit of your personality, an elaborate extension of your character, so there is no right or wrong way to choose, it is merely a matter of taste. The experts at GN Designer Jewellers in Melbourne can help you navigate our range, or guide you through the process of designing your own cocktail rings or dress rings. If you have a dress ring that needs a new lease on life, our master jewellers and craftspeople at GN Designer Jewellers will be happy to restore, repair and refurbish your precious jewellery. Any diamonds and precious gemstones along with their platinum, gold or silver mounts can be cleaned and polished to bring back their original sparkle. GN Designer Jewellers are experts in custom-made cocktail and dress rings, so this could be the perfect opportunity to begin a new tradition, designing something special that you can pass on. At GN Designer Jewellers we over 20 years of hands-on experience in jewellery making and design. We offer our customer’s meticulously handcrafted cocktail and dress rings that are created with the utmost care and precision. Our jewellers will take the time to get to know you to create a unique piece or choose the perfect symbol from an extensive range of expertly handcrafted dress rings. For more information about dress rings or cocktail rings in Melbourne, you can contact GN Designer Jewellers on (03) 9602 2153, or stop by our store at 62 Hardware Lane, VIC Melbourne Australia.